These bars pack all the taste of a pie into a small bar. I’ve made them twice now, and I’m sure I’ll make them again this Thanksgiving season. I used this recipe, and followed it to the letter. I decided to make my own caramel sauce, using this recipe. In the case of caramel, homemade really is better than storebought. I will caution that in the first batch, I used the whole teaspoon of salt, and thought it was a bit much. My second batch only used half a teaspoon, and I think it needed more. Go figure. Do use the good vanilla though – it really comes through in the complex flavors. I used some bourbon infused vanilla that I picked up at Woodford Reserve while there on a distillery tour last summer, and you could taste it. You should probably make the bars and drizzle the caramel sauce the night before you plan on needing them. 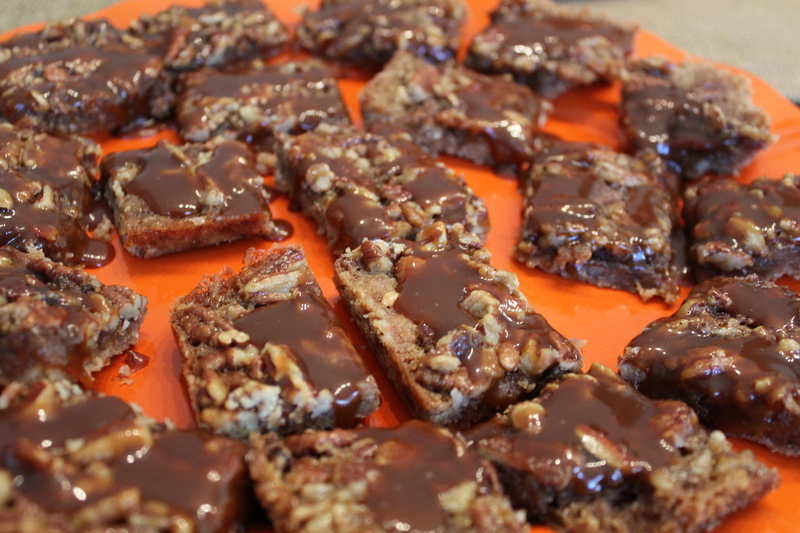 The first time I made them, we brought them to a party that evening, and the caramel sauce got everywhere. It could have used some time to harden up. Still tasty, just a bigger mess. They are quite rich, so I cut them into teeny squares. Perhaps that was just because i love bite sized desserts, but I think they really are better in bite sized pieces. I’ll be sharing one more dessert post with you (hopefully this week) to help you choose some great Thanksgiving night desserts. Stay tuned!